Zambia qualified for the 2016 African Nations Championship (CHAN) quarter-finals with a 1-0 win over Uganda in Group D, but Zimbabwe were eliminated after their 1-0 defeat to Mali. 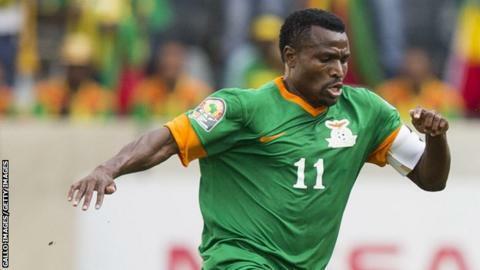 Zambia had their captain and former Africa Cup of Nations winner, Christopher Katongo, to thank for their victory after he scored just before the break. The result put Zambia top of Group D with a maximum six points from two games. Katongo, who captained Zambia to their Nations Cup victory in 2012, was thrown out of the senior national team two years later after a row with the coaches. But the 33-year-old was given a reprieve and picked for the CHAN squad. He now plays for Green Buffaloes in Zambia and can therefore play at the African Nations Championship which is for locally-based players only. His 41st minute header against Uganda helped Zambia become the third team to qualify for the quarter-finals, joining hosts Rwanda and DR Congo in the last eight. Earlier in Group D, a solitary goal from Moussa Sissoko was enough to give Mali a win over Zimbabwe in their second fixture. It ended Zimbabwe's hopes of progressing further, after they had already been beaten 1-0 by Zambia in their opening match of the group. Mali broke Zimbabwe hearts eight minutes from time, as Sissoko volleyed in from close range to score. The final Group D games take place on Wednesday 27 January. Uganda play Zimbabwe and Mali face Zambia.